Following up on the Tompkins Square Park red-tailed hawk fledgling who was rescued by Urban Park Rangers on Wednesday, the hawk is now in the care of Wildlife in Need of Rescue and Rehabilitation (WINORR). Initial tests revealed the hawk is suffering from secondary rodenticide poisoning and is in very serious condition. Rodenticide poisoning is a major concern for hawks (and other raptors and wildlife) in the city. In 2016, we had the misfortune of seeing a hawk die in Collect Pond Park after it ingested rodenticide. It's a horrible death for any animal. The Parks Department does not use rodenticide in Tompkins Square Park, but there is nothing to stop private property owners from using it, and the hawks do not confine their hunting to the park. They could have brought in poisoned food from anywhere in the neighborhood. For now, all we can do is hope the hawk was captured in time to respond to treatment. The people at WINORR are fantastic and are doing all they can to save our baby hawk. They do not get funding for their work, so please consider donating to their cause. 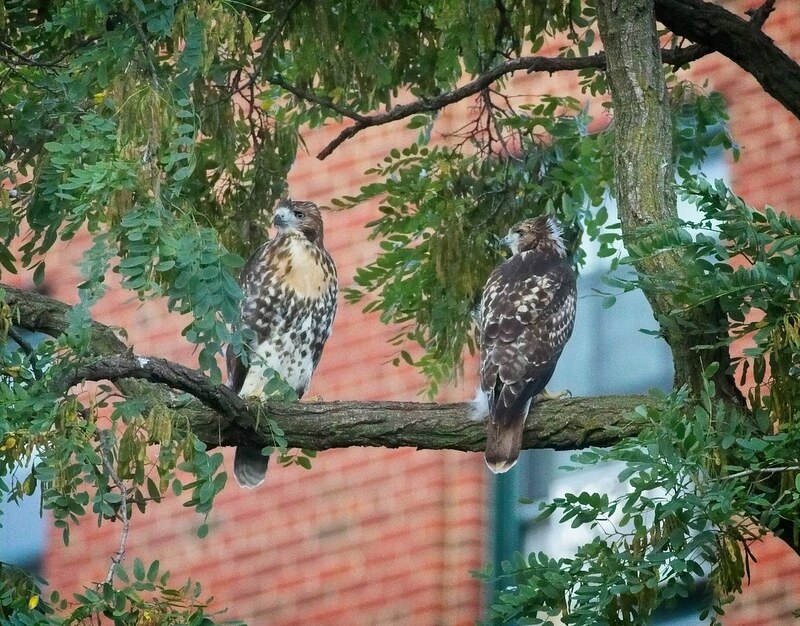 The photo below was taken on July 23 and shows the older fledgling who is currently with WINORR on the left, and the younger sibling on the right. The younger one seems to be okay and can be seen flying around the park. WINORR is also still caring for Dora, who is reportedly doing well.